Life expectancy dipped a bit for white women in U.S.
Life expectancy for white women has fallen a little, according to a new government report. The CDC previously reported that the life expectancy for all Americans born in 2014 was 78 years and 9½ months— the same prediction made for the previous two years. Wednesday's report gives a breakdown by race or gender. It predicts that a white girl born in 2014 could expect to live about 81 years and 1 month, about five weeks fewer than the previous year's prediction. The last time there was a one-year drop for white women was in 2008. That was considered a statistical blip, said Robert Anderson of the CDC's National Center for Health Statistics. That could also be the case for the 2014 decline "or it could be a harbinger of things to come," Anderson said. That won't be known until data from more years come in, he added. Some recent reports have shown rising suicide and drug overdose death rates for white women — particularly middle-aged ones. 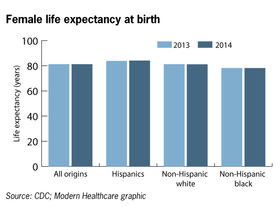 Hispanics had the highest life expectancy in 2014 — at 84 for Hispanic women and more than 79 for men. Black Americans were lowest, at about 78 for women about and 72 for men. For white men, it was 76½ years.